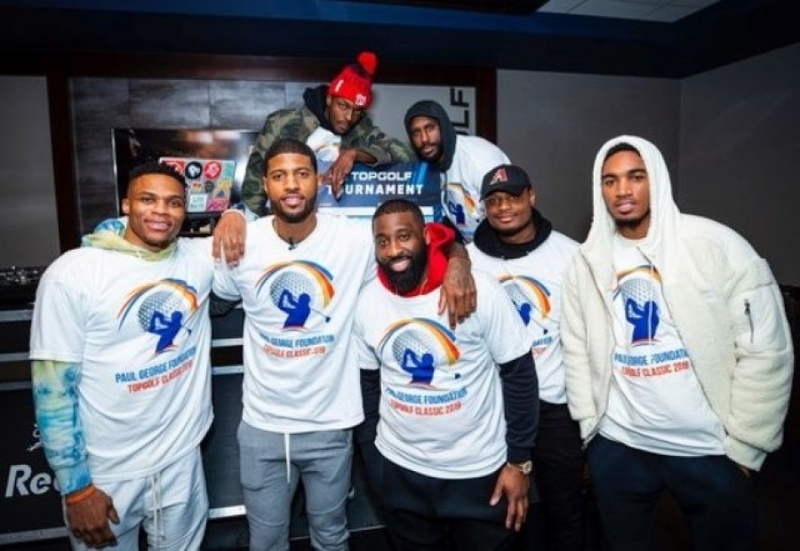 On February 6th, as a part of the inaugural Paul George Foundation Topgolf Classic, Paul George hosted a fundraiser to raise money for a new, kid-friendly fishing dock at South Lakes Park in OKC. Thank you Paul George for donating Topgolf proceeds to our Fishing in the Schools program! Arbuckle: February 9. Elevation above normal, water 47 and stained. Largemouth and smallmouth bass slow on jerk baits and Alabama rigs. Crappie being caught on white spoons and crappie jigs at 44-50 ft. in mid-lake along drop-offs. White bass have left the deep water headed for the creeks. All other fishing slow. Report submitted by Jack Melton. Broken Bow: February 8. Elevation above normal, water 51. Largemouth, smallmouth and spotted bass good on crankbaits, flukes, jigs and spoons around brush structure, points, river mouth and standing timber. Walleye fair on crankbaits and rogues along channels, points, river channel and river mouth. Blue catfish good on cut bait and live bait in the main lake and around points. Blue catfish being caught on juglines in 50-60 ft. of water along shelf. Report submitted by Dru Polk, game warden stationed in McCurtain County. Eufaula: February 8. Elevation above normal, water murky. Blue and channel catfish good on shad along channels and flats. Crappie fair on tube jigs around brush structure and standing timber. Report submitted by Jake Bersche, game warden stationed in McIntosh County. Hugo: February 8. Elevation below normal, water 48 and murky. Blue and channel catfish fair on cut bait, dough bait, live bait and shad below the dam, in the main lake and river channel. Crappie fair on minnows and jigs below the dam, around brush structure, main lake, river channel and standing timber. Report submitted by Andrew Potter, game warden stationed in Choctaw County. Konawa: February 7. Elevation normal, water 42 and murky. Largemouth bass fair on Alabama rigs, crankbaits, jigs and plastic baits in the main lake, around points, river channel and weed beds. Striped bass hybrids and white bass slow on Alabama rigs, crankbaits and live shad in coves and river channel. Channel catfish fair on chicken liver, cut bait and stinkbait in coves, along riprap and weed beds. Report submitted by Garret Harley, game warden stationed in Seminole County. Lower Mountain Fork: February 8. Elevation normal, water clear. Trout excellent on nymphs, PowerBait, tube jigs and salmon eggs along channels, creek channels and spillway. Report submitted by Mark Hannah, game warden stationed in McCurtain County. Lower Mountain Fork: February 7. Stocked approximately 1,600 rainbow trout on February 7. Report submitted by April Drake, secretary at the southeast region office. McGee Creek: February 8. Elevation normal, water 49. Largemouth and spotted bass fair on crankbaits, jigs and plastic baits along flats, main lake, points and standing timber. Crappie, white bass and spotted bass slow on minnows and jigs along creek channels and standing timber. Report submitted by Jay Harvey, game warden stationed in Atoka County. Pine Creek: February 8. Elevation normal, water clear. Largemouth bass good on crankbaits, plastic baits and spoons in coves and creek channels. Crappie excellent on minnows and spoons around brush structure and channels. Channel catfish fair on cut bait in the main lake. Report submitted by Mark Hannah, game warden stationed in McCurtain County. Robber’s Cave: February 7. Stocked approximately 300 rainbow trout on February 7. Report submitted by April Drake, secretary at the southeast region office. Robert S. Kerr: February 8. Elevation normal, water murky. Crappie excellent on minnows and jigs along creek channels and mouth of Big Sanbios. Blue catfish fair on cut bait, shad and stinkbait along river channel and river mouth. Report submitted by Allen Couch, game warden stationed in Haskell County. Texoma: February 7. Elevation below normal, water 48 and murky. Gates are closed at Denison Dam so the lake should be clearing up depending on rainfall. Blue catfish good on cut bait and shad in the main lake and river mouth. For blue cat, fishing anglers should focus on the river mouths in 15-25 ft. of water drifting cut or whole shad. When rigging drifting setups use a float to hold bait slightly off the bottom for cats. Also, use drift socks to control drift speed. Striped bass good on Alabama rigs, flukes and live shad below the dam, along the dam, main lake and river mouth. Striper have been spotty dead-sticking due to the warmer temps, but with cooler weather coming back dead-sticking should pick back up. Live bait has been producing fish when dead-sticking is slow, bait has been holding in Catfish Bay. Large schools of striper have been in the West end of the lake. Crappie fair on hair jigs, jigs and tube jigs around brush structure and points. Crappie are holding tight to bottom in deeper water under docks and on points with bottom structure, drop jigs to bottom and reel up 1 ft. for good results. Report submitted by Trey Hale, game warden stationed in Bryan County. Wister: February 8. Elevation above normal, water cloudy. Largemouth and spotted bass slow on bill baits, crankbaits, plastic baits and spinnerbaits around brush structure, channels and points. Blue and channel catfish slow on chicken liver, cut bait, hotdogs, punch bait and stinkbait below the dam, along channels, main lake, points and standing timber. Crappie fair on minnows and jigs below the dam, around brush structure, channels and standing timber. Report submitted by Thomas Gillham, game warden stationed in LeFlore County.